Coming in March 2019, we are launching a new offering. 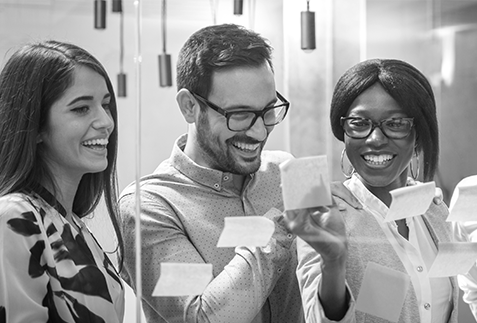 Company teams will get insights into how German firms accelerate innovation by leveraging the power of the world’s leading applied research institute. For the past three years we have been piloting these approaches with the New Jersey Innovation Institute (NJII). We are now prepared to offer these workshops to a national audience. Organized around company teams, this workshop will introduce Market Explorer and Technology Radar, the powerful tools and frameworks developed by Fraunhofer IAO to accelerate innovation. Each team will learn how Fraunhofer approaches two distinct but similar problems: finding new markets for technologies; and finding technology solutions for market problems. In these workshops, company teams will work together on specific exercises to understand the Fraunhofer methodology. They will then work separately on a technology management or innovation management challenge that they bring to the workshop. 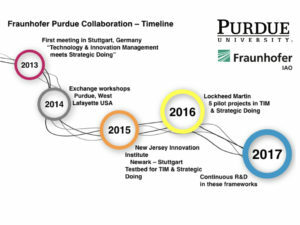 The development of these workshops began over four years ago, as ou Lab began exploring how to integrate the technology and innovation management work of Fraunhofer IAO with the agile strategy work conducted in our Lab. We then engaged our partners at NJII to conduct pilot projects. We conducted a number of these pilots with Lockheed in Moorestown, New Jersey. Contact us to learn more.